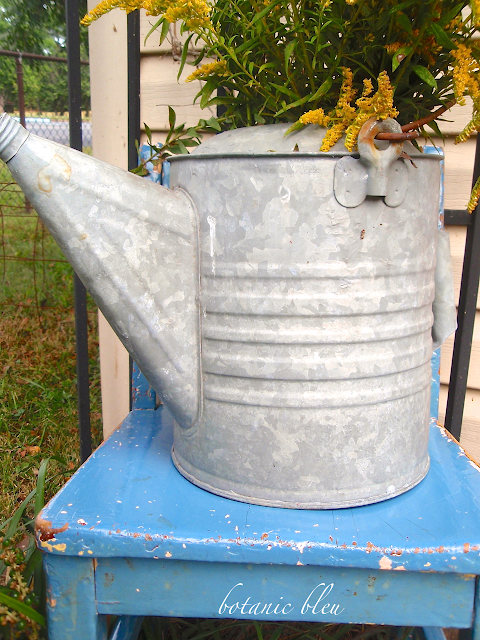 A vintage watering can was not on my list when I went to The Market on Chapel Hill in Pike Road, Alabama last weekend. No, I went looking for white stoneware sugar bowls, but arrived too late to buy them. They were all gone. 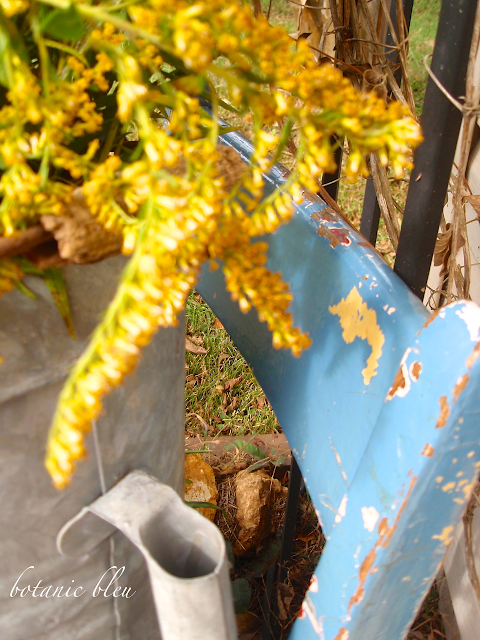 Then I spotted the vintage galvanized watering can filled with stalks of opened cotton bolls. No cotton bolls for me; I can get armloads free from extended family and friends who farm cotton all around my family's Alabama home. Cotton is one of my favorite fibers to wear, but I've never wanted to decorate with cotton bolls. You know how it is. I saw cotton growing all my childhood. My grandfather was a "share-cropper" who raised cotton as a cash crop. I played in cotton fields. My uncles chopped cotton into the early summer and picked cotton in the fall. No, cotton has never been a decor item for me. But, the vintage watering can? After checking the price tag, I knew the little can was going home with me. Here I was looking for white stoneware sugar bowls and instead, found one of the things that has been on my wish list for the past couple of years. Does that ever happen to you? Truly vintage. That worn rough wooden handle is not reproduction. That kind of wear and tear comes from repeated use and water splashing onto it over several years. 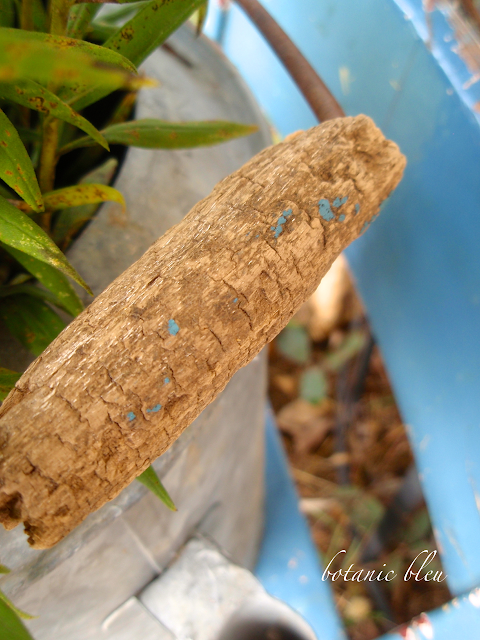 At one time, it was B L U E, but now only a handful of blue paint chips cling to the rough wood. Speaking of blue, the small chippy blue painted child's chair was in the same vendor's booth. I could not resist it. So, what did I do with these unexpected finds? Out I went into the countryside to gather bundles of goldenrod. Goldenrod blooms everywhere in Alabama along ditches, in hedgerows, and in open sunny areas near woods. The muddy green spotty rubber boots and red handled clippers were my mother's. Both of these were used often by her and are not just photo props. 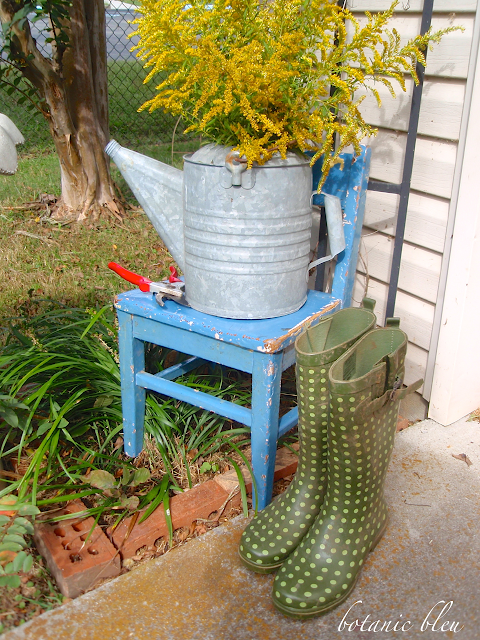 Some of that mud was added to these boots when I clipped the goldenrod. Mother's shoe size is larger than mine. The boots are way too big for me, with my feet sliding around inside the boots, but I did not have any of my own boots with me. As I clomped around a newly mown ditch near a country road, I stumbled over the too-large boots and fell into the soft grass cuttings landing on my knees and outstretched hands. It did not even really hurt because the grass cushioned my fall, and the ground was wet from rains the week before. 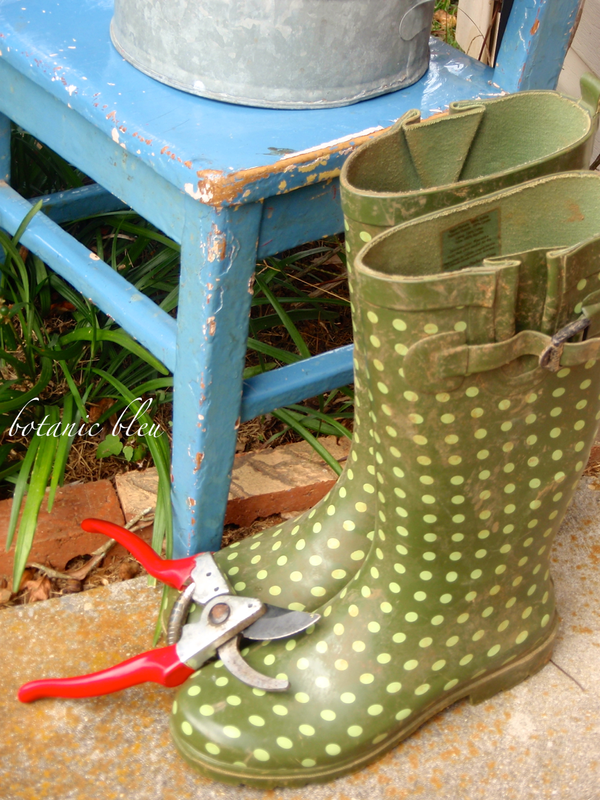 Yes, I added some mud to the green spotty boots. 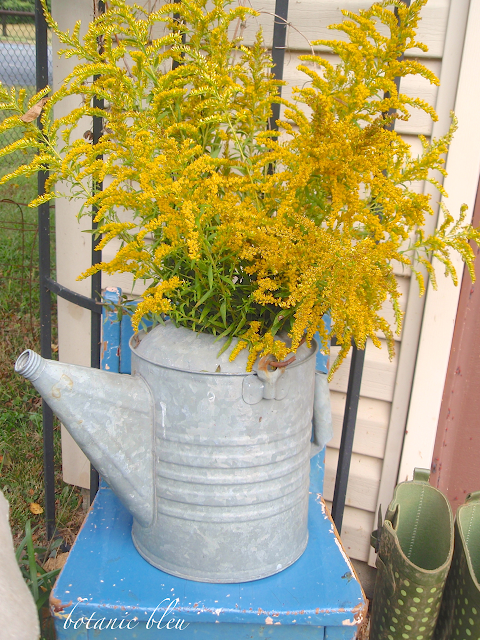 Goldenrod, an abundant humble wildflower, seems appropriate for an equally humble galvanized watering can past its prime. It also seems right as a fall arrangement. At one time, goldenrod was the state flower of Alabama, but the women of Butler County lobbied to have it replaced by the camellia. Ironically, the camellia is not indigenous to Alabama; rather, it comes from China. The little blue chair has been many colors including goldenrod yellow. A little bit of the south of France, a bleu and goldenrod color combination, is also a perfect fall combination for the north of Alabama. The trip to The Market on Chapel Hill was also a little bit of a French experience. The French way of life includes seizing unplanned opportunities instead of being disappointed for opportunities lost. Live in the moment. Hi Judith, I love the golden rod in the watering can and the rain boots. So pretty. Yes Judith the goldenrod is a perfect replacement for cotton balls. I do love the look of wild cotton on their brances, but I get it we something's don't have a need for something we grew up with. That's how my grandmother felt about old quilts, she grew up making and using them for everything and in her later years she had no love loss for them....she would much rather have a new comforter on her bed, as for me give me that faded old one-sheet French quilt and I am in love with it. The watering can has now found a great home, and yes I tell shop owners and venders and dealers all the time I am just looking! Most of the time they will say can I help you find something? And I reply no that's okay I will know it when I see it. 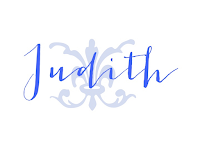 Thank you for your sweet comment over at my blog ~ you have no idea how it made my day, Judith! What an absolutely adorable vignette! 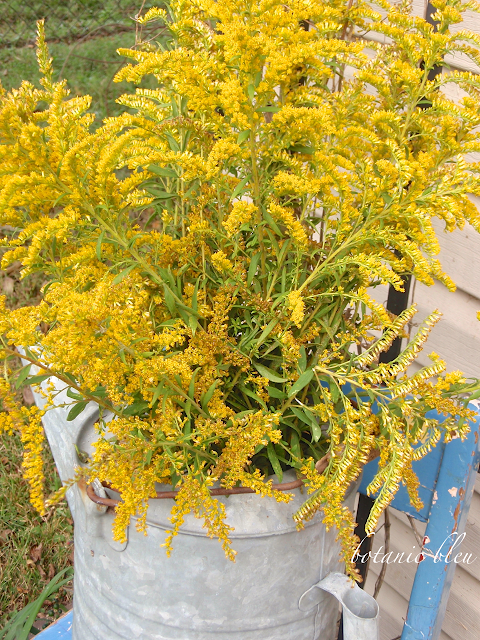 Goldenrod is great filler and is such a pretty color...goes with anything!! Just too cute!! 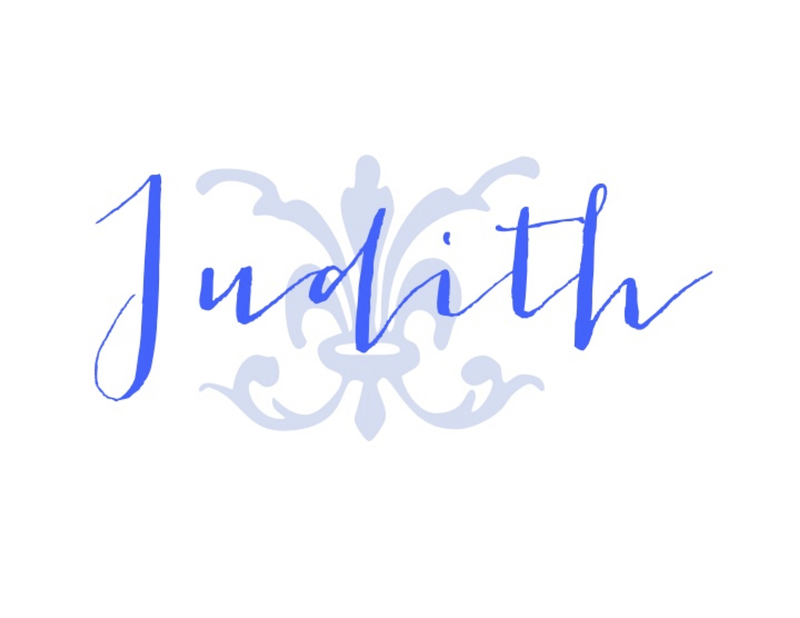 Judith, good things come to those who are patient. I've learned over time that usually when I search for something specific, I don't find it Yes, for me, serendipity is the best! I think your finds are both charming and practical. Your vignette is colorful and touching. 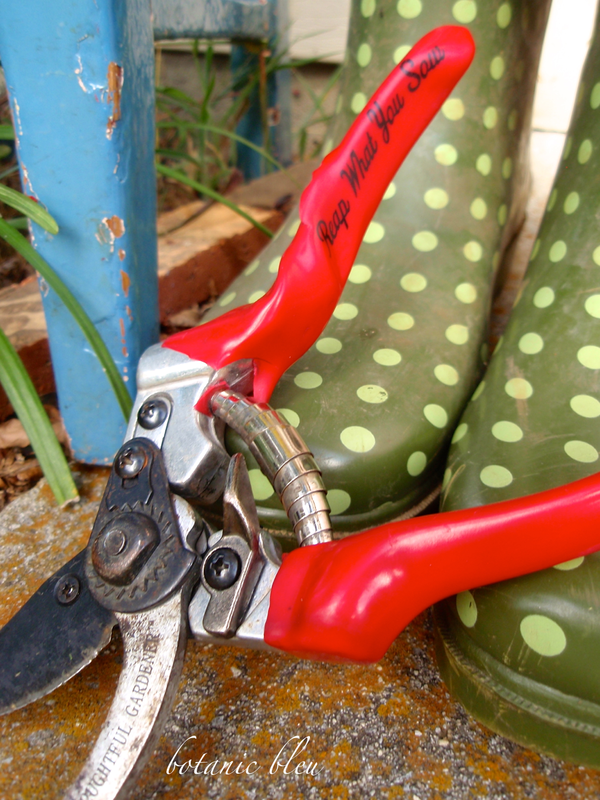 I loved that you included your mom's boots and shears. Perfect little grouping. Beautiful! Love your new treasures! Many times, dear friend, I go it looking for one specific item and come home with something totally different!!! Great find of the galvanized watering can!!! LOVE the blue child's chair with all the hues of paint!!! Thank you for your sweet comment and visit today!!! I only have three orange pumpkins on my Trick OR Treat Tablescape!!! The place setting to the back of the table doesn't have an orange pumpkin!!! What an absolutely gorgeous display! Beautiful Judith! Thanks for sharing at Home Sweet Home!